Located in the heart of Hokkaido lies a magnificent paradise for flower lovers – Furano. If Netherlands is the garden of Europe, then undoubtedly, Furano will be the garden of Asia: a land of surprise, nature, and romance. The mesmerizing lavender fields of Furano are a familiar site to those visiting central Hokkaido, with the soothing, rolling purple fields of lavender a major lure to tourists in this region. Ironically, according to the locals, Furano was not always the city of flowers and pleasant fragrances. Instead, it was originally known as Furanui (lit. “foul-smelling”) city by the indigenous Ainu people, thanks to the powerful fumes emanating from the sulfuric fumaroles near Tokachi Peak. It is funny that many years later, Furano is not only no longer a “foul-smelling city,” but a popular town among thousands of tourists. When exploring Furano, walking around the Shikisai-no-Oka in Miei town is recommended, where the view is wide and open. 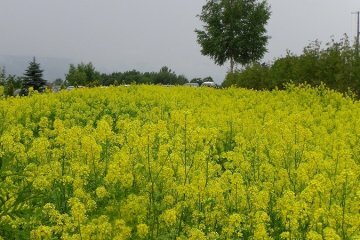 In the summer (from June to September ), a variety of flowers start blooming during different time periods. Among of kinds of flowers, lavender is the most well-known while other flowers such as lilies, poppies, and lupins are also cultivated here, sprinkling the fields with different visually appealing colors. Farm Tomita is usually the most recommended spot to see Lavender. Lavender blossoms start blooming in June and are in full bloom from mid-July to early August. During peak season, it is suggested that people climb up to the highest point Rokugou Observatory where they would be pleasantly surprised by the amazing views: flowers of gradient colors harmoniously complement each other as the rainbow color gently slopes down. As the plush-green meadow stretches away into vastness, mountains serve as the background, accentuating the whole gorgeous scenery with a therapeutic greyish-blue color. During mid-July, when the sun is extremely bright, it elevates the saturation and adds a golden filter to this place, making the flowers almost too glamorous to look at. 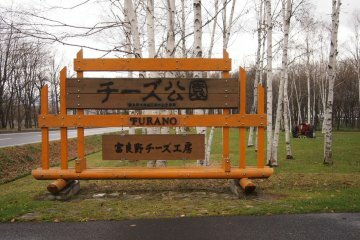 Furano is never just about the flowers since there are way too many other things to see and to discover. Besides taking artsy photos of the lavender fields, some freshly-made lavender ice-cream will satiate your craving for some dessert in the summer. A wide range of products made from lavender is offered at the souvenir shop for those who want to do some shopping. When it comes to the melon season, the local farms offer guaranteed-super-sweet melon for tourists to try. In addition to that, Furano is also the perfect place to get wined and dined. The local Furano Winery offers free wine tasting, where tourists can try the genuine Japanese wine. Not a wine person? No worries, there’s also the Furano Cheese Factory for people to enjoy some locally-produced cheese while observing the production process. One great thing about Furano is the various ways of transportation people can choose from in order to enjoy the beautiful views here. People can go hiking, cycling or even rent a scooter. For those who prefer public transportation, buses or trains are also options. On top of that, car rental is also offered for those who are planning on driving around or going on road trips. It is even possible to take a taxi here. If you’re interested in Japanese culture, some summer festivals and events here will give you an authentic experience of traditional Japanese culture. The annual festival “Hokkaido Heso Matsuri” are held in Furano (usually in late July), where local dancers would turn their “heso” (belly button) into a face using paint and props. This annual festival has been around since 1969 and has become an iconic event of this town filled with laughter and humor. When it comes to the winter, the high-quality snow resort attracts ski enthusiasts from all over the world. As the heaven of powder snow, Furano boasts over 950 vertical meters of skiing. This world-class snow resort has hosted more than 12 national and international events such as the Snowboarding World Cup. For those who are here just for sightseeing, during the winter, cultural performances take place regularly and volunteer ski hosts often show tourists around the exhilarating beauty of nature here. If you’re looking for a place to explore at your own pace and to discover the spectacular natural views of Japan, Furano, a place with fairytale-like sceneries as well as the best quality of food, is where turns your dreams into reality. Furano Marche: a food paradise and a one-stop souvenir shop that foreigners and locals both enjoy. 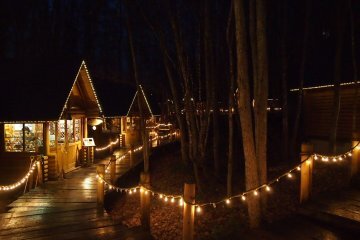 The Forest Clock (Mori no Tokei), an unbelivably gorgeous cafe surrounded by a forest of tall pine trees. Get your cheese fix at Furano's Wine House, where the specialty is fondues made from locally made cheese and the views of Daisetsuzan.. Located within a five minute walk from the base of the Kitanomine ski slope and gondola, tucked away from the main road, B&B Furano..
Natural and luxurious - Natulux Hotel in Furano. Unbeatable location and classy, modern, swanky interior. Stay no where else. 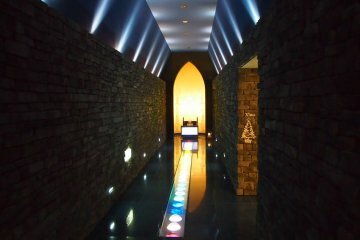 Offers everything you need to get ready for a fantastic time in Furano.